THE CHAMBERS TAPE, my new episode of Tales From Beyond The Pale Season 3 is now live on Amazon, iTunes and talesfrombeyondthepale.com! (All the great s3 eps are available!) Over a year in the making. Featuring the incredible voice talents of Supernatural’s MISHA COLLINS, Green + Wild Canaries’ SOPHIA TAKAL and LAWRENCE MICHAEL LEVINE, and from my Chiller short The Caregiver, the excellent KERSTEN HAILE. Poster art by the legendary GRAHAM HUMPHREYS! 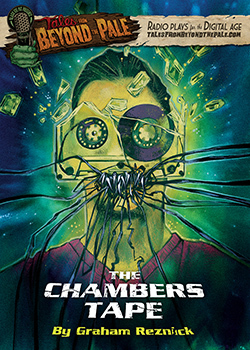 THE CHAMBERS TAPE is an authentic new age meditation cassette tape from the late 1970s. Please listen while wearing headphones. Close your eyes, relax, and try not to lose your mind. UPDATE: Reached #1 in iTunes Fiction Audio Books!